What is this series and what will it help me do? The series is designed to help create a shift from anxiety to curiosity. During transitions, people often get stuck in worry, doubt, wringing of hands, confusion, chaos, and internal “noise” about not knowing. Many find it hard not to know the answer; not to know exactly what’s next. The goal of the workshop is to give you some time, space, and stillness not to know. I use creative writing and art as ways to connect to the right brain where creative answers, inner knowing, and wisdom exist. The workshop gives a space to explore, be curious, wonder, and happen upon realizations. I don’t consider myself a writer. Can I still sign up for the Butterfly Series? Absolutely. In fact, a great number of the participants would not call themselves writers. The workshop is designed to use writing as a way to connect with yourself and your inner knowledge. The exercises are structured so that everyone can benefit from them. In all the time I’ve been facilitating the workshop, I’ve never had anyone who didn’t find the writing exercises useful. That said, some of the exercises will move you more than others. Many folks are surprised to see what they can produce once they put pen to paper. I do consider myself a writer. How will the Butterfly Series add value to my craft? The workshop is generative, meaning I provide many opportunities for participants to create material. If writing is your craft, you will generate pieces that you can take with you and develop into longer pieces (stories, poems, personal essays, &/or plays) should you so choose. In addition, the weekly writing prompts in your workbook provide a solid structure for writing. You may also get ideas/inspiration for your work from that opportunity. I’m concerned about the art part of the workshop. What do I need to know? As with the writing, the workshop is designed to promote ease. The entire session has to have you feeling more relaxed and inspired than when you walked through the door. Each person uses their creativity differently in the art projects, but each project is something you can do without any formal training or any particular skill in art. The focus is on the process of accessing your creative brain and not on the end product (although many of you will find great delight in what you make!). Why a group instead of individual work? How do the other women support my transition? Isolation is one of the ways that many people respond when they are feeling challenged, uncertain, or scared. Being in a group of women who are also experiencing some sort of life transition can be validating and supportive. The workshop is structured to be self-paced, meaning that everyone is on an individual journey, but we come together over the course of six-months to be in community and explore what’s happening inside of us. You may meet someone in the workshop with whom you’ll maintain an ongoing connection/friendship. If that happens, wonderful. It may simply be that the other women are there to be in community with you during this part of your journey. I don’t know if I can make all six sessions. What if something comes up? Showing up to each session is critically important. Since we only meet once a month, missing a session means you miss connecting with the group for almost 2 months. That said, life happens and emergencies arise. How I accommodate for that is I offer one ½ hour makeup session over the phone if you end up missing one session. The agenda for that session allows for us to do 3 things: check in, engage in one exercise related to the theme of the missed session, and complete the taking flight page in your workbook. I only offer the make up one time per person over the course of the six months. The make-up allows you to stay on course and to connect to the theme you missed. If you know in advance that you will have to miss more than one session, I’d recommend not signing up for the Butterfly Series now and consider applying to the next one. Since I don’t offer refunds for missed sessions, you need to realistically assess your ability to commit. Is there any work in between sessions? Each participant receives a workbook at the first session to use during the workshop. The workbook contains 26 weeks of writing prompts. I strongly encourage participants to do weekly writing in the workbook. That amounts to about 10 – 15 minutes per week of writing. My experience is that women who do the weekly writing get more out of the Butterfly Series. Of course, there is no consequence for not doing the writing and since the workbook is yours to keep, you could choose to do the writing prompts at other any point in time. How many women participate and what’s the group demographic? Participants vary across age, race, class and sexual orientation. I’ve had participants in their twenties, in their seventies and everything in between. I have a personal commitment to work towards a group that is racially diverse, and am intentional about recruitment and reaching out to a multiracial group of prospective participants. I don’t have a life transition that I can name, I only have a feeling there’s something brewing. Is the workshop still right for me? Yes. You don’t need to name it. You only need to know there’s something you want to explore. I don’t know where I’m going. I’m confused about what’s next. Is the workshop still right for me? Yes. I would actually encourage you NOT to know where you’re going and what’s next. This is a journey into the unknown, for many, and the workshop provides support and structure for that journey. The goal of the workshop is to get you to be more in tune with your inner knowing and the right brain. As you do that, answers / signs will emerge. Your job will be to follow them. Will I have all the answers regarding my current life transition by the end of the six-month workshop? Probably not. Some women enter the series with a very specific transition (moving to a new apartment; life after a relatively minor surgery). Other women are looking to explore bigger life questions (What do I want to do next in life? How can I let go of the fear that is keeping me from taking the next step? What’s my vision for what’s next?). Depending on the nature of your transition and your personal process of change, you may get “answers” or you may simply take the next step in your journey. I’d say come prepared to explore and see what emerges. Most importantly, trust the process. What is the value/take away at the end of the series? The takeaway, ideally, is a heightened ability to listen to yourself and to trust your instincts, feelings, and inspirations. Beyond that, it is impossible to know what magic will happen for you. How do I apply for the Series? In order to apply for the series, you must schedule a ½ hour phone conversation with me. During that conversation, I can discuss the series with you, answer any questions you might have, and learn a bit about what you are hoping to get from the series. From that session, we’ll both be able to assess whether the workshop is right for you and/or right for you at this particular juncture in life. What is the cost of the series and what does that cost include? The workshop cost is $125/session, for a total of $750 payable at the time of registration. The cost of the workshop includes your workbook with 26 weeks of writing prompts, all your art supplies, breakfast, snacks, and a vegetarian lunch. Payment can be made via PayPal (if you have an account) or with a check. The workshop is what I need in my life now, but I am experiencing severe financial hardship. Please contact me to discuss your situation if you are experiencing severe financial hardship. I make absolutely no guarantees that there will be an enrollment option, but I’d be open to discussing what you might need to make this work. How many times a year do you offer The Butterfly Series? Do you ever offer it in the East Bay or in San Francisco? Beginning January 2018, I’ll only be offering the Butterfly Series once a year (each January – June). I currently only offer the workshop in Mill Valley, CA. I did offer it once in Oakland in 2016. I don’t have plans to offer it anywhere other than Mill Valley at the moment. If, however, you have a group of six women who are interested and committed, please contact me and I’ll certainly be willing to discuss possibilities of holding the workshop at another venue. A dear friend of mine who read these FAQs asked me about men. The short answer is that when I think about my life purpose, I feel that my work is to empower women. Much of my life experience is rooted in working with women. That said, I have two sons who I love more than anything, and if there was a group of men in the Bay Area who self-organized and wanted me to facilitate a series for them, I’d certainly entertain that conversation. Have you written anything on life transitions? 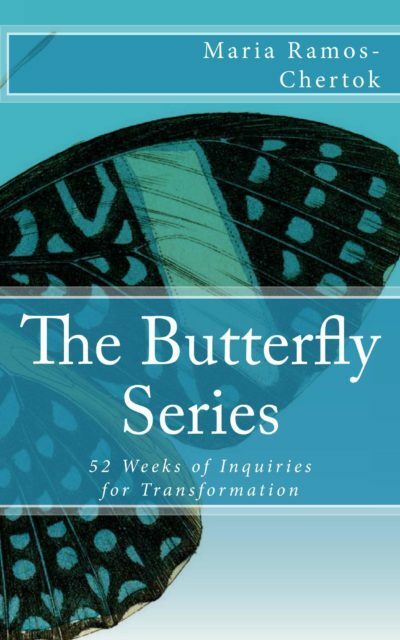 What’s available after the 6-month Butterfly Series? What if I want to continue on my journey by engaging in creative writing and art? I offer a Part II of the Butterfly Series. I’ve done many different types of things in Part II, including a storytelling workshop, a session on personal boundaries, a session on finding your way. In Part II, I’ve also hosted sessions where I invite in guest artists. We’ve had guest artists lead a painting workshop, a drum making workshop, and a session on narrative therapy. Part II workshops are only open to women who have been through the six-month Butterfly Series (aka Part I). I often invite participants in Part II to share topics that they’re interested in exploring. Beyond the Butterfly Series, I am also available as a life coach, should that be of interest to you.